This station captures Carrollton's past, present and future. Powder-coated steel columns, each containing a series of windows, line the platform. Historical photos have been laser etched into the windows, and a light shines from the bottom to illuminate them. Station artist James Michael Starr scoured the station site for artifacts and inserted these inside the windows to create a heroic portrait of collage art. The aerial platform is made of green concrete and has historical documents sandblasted into it. 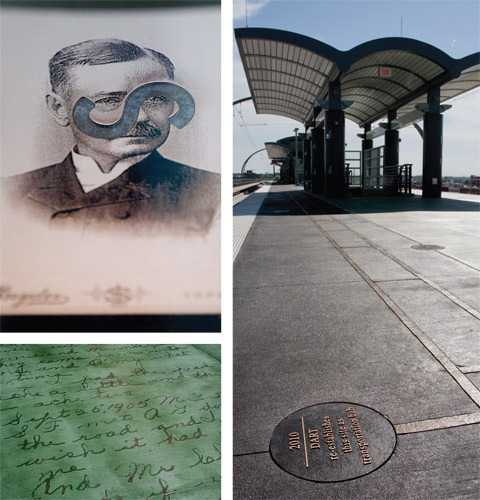 Riders can read over the actual text of these archived documents to catch a glimpse into the area's past - learning the names of early settlers, words from the town's charter and other historical facts and figures in the process. The paving at the edge of the platform is done in a dark brown concrete and contains a timeline comparing significant international events with events that happened in Carrollton around the same time. These events are called out on bronze plates with embossed text. The whole idea pays homage to the area's settlers, while giving the citizens of today a very usable and contemporary station to enjoy.